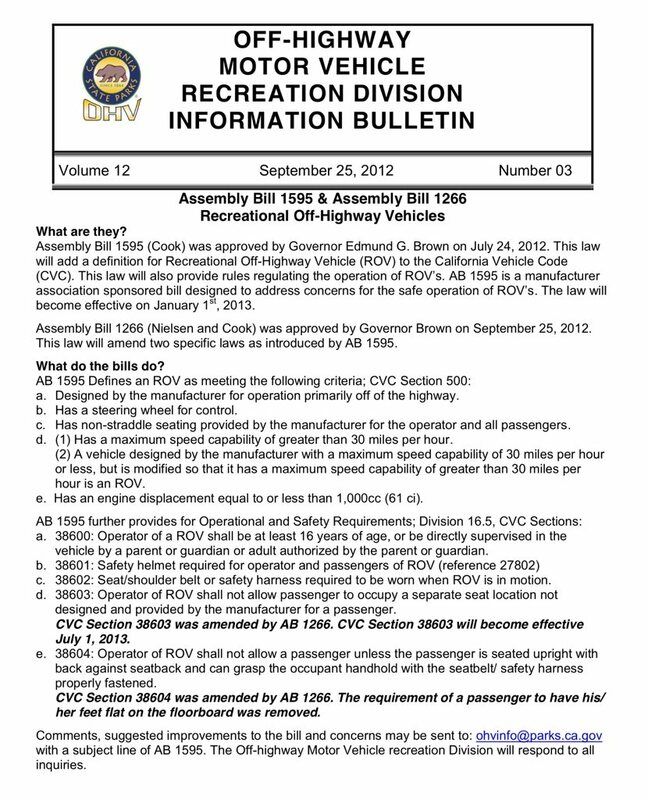 Just posting as a reference of how the California helmet law stands along with the non-factory rear seat law. Basically you will have to wear a helmet when driving a SxS in California starting Jan 1st 2013. And the use of non-factory installed rear seats (OEM) will not be allowed after July 1st 2013. The rear seat part of the law was postponed, so it is possible it may be changed some before going into effect next year. Last edited by Flyingbryan; 11-11-2012 at 05:06 PM. I know this has been a heated topic...It has opened some peeps eyes..they need to get involved instead of thinking someone else will fix this for me attitude..
Yep the Helmet law "line b" goes into effect Jan 1st 2013 and the part that you have to be able to reach the hand hold wile seatbelted and back against the seat "line e" also goes right into effect. Everyone can continue to use your rear seats in California, of any kind for now. The reason this part of the bill "line d" was delayed until July 1st 2013 was because they realized it was needing to be reworked before going into effect and likely will have some kind of a grandfather clause or maybe a safety inspection. We will not know more until the law makers are back in session next year. The law even as it stands will still allow you to have a after market add-in rear seat just you can't use it for passangers after July 1st 2013. I personally think they will have a list of requirement like rear seats will have to be bolted to the frame, rollbar, and head clearance from rollbar. And of course the seatbelts are a no brainer. Last edited by Flyingbryan; 11-13-2012 at 03:33 PM. The 4 seater roll cage to meet minimum standards thru an inspection, like NHRA certification with a sticker, should be allowed as well. Maybe require recertification every couple years too.